For our last meal before #2 arrived, we had a chance to go to Gamekeeper’s, a longtime Chagrin Falls establishment. As you could guess from the name, it has a lodgy kind of feel, with lots of wood paneling and fireplaces, and the menu does indeed feature several dishes incorporating game meats. Since this kind of food isn’t offered most places, we took full advantage. 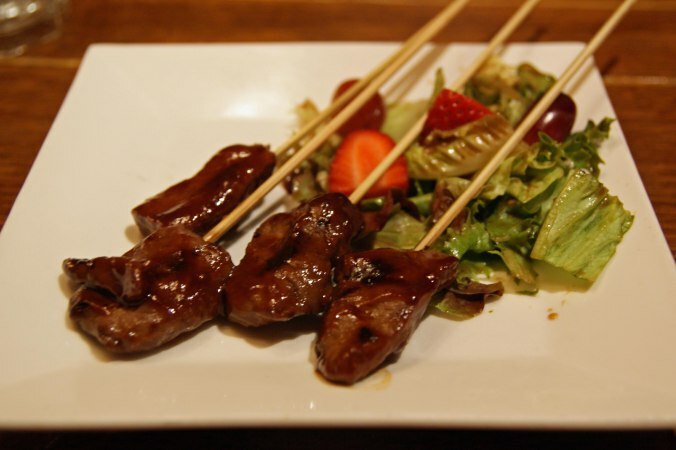 We started with South Texas antelope skewers (okay, not local – I can’t recall ever seeing an antelope wandering through the backyard), served with greens and a cherry hoisin BBQ sauce. The meat was very good; maybe a little chewier than your standard beef tenderloin, but not at all to the point where it was like eating a rubber band. Not too gamey either, and the sauce was sweet and tangy. Nice selection. 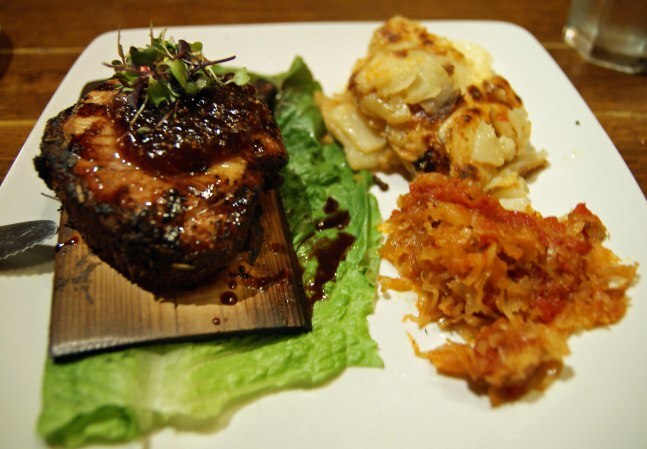 For the entrees, S tried the Cedar Planked Molasses Glazed Pork Chop, which came with scalloped potatoes, tomato bacon kraut(! ), and fig apple butter. Tender meat, the kraut was awesome, and I’m really enjoying fig things lately – it adds some sweetness, but not overbearing. Very good. 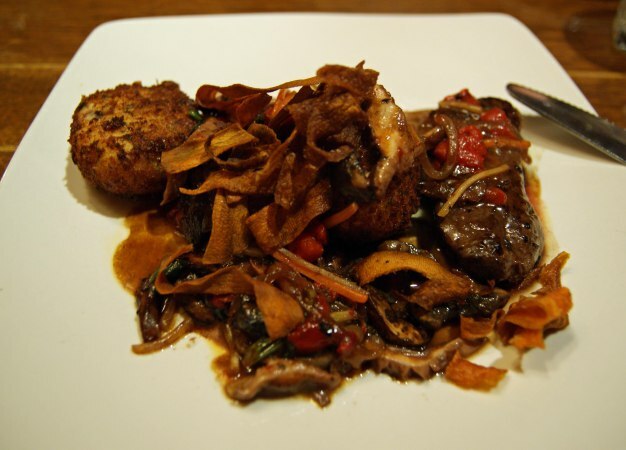 I tried the South Island Elk Strip Loin Medallions, with a mushroom sauce, potato croquettes, and topped with crunchy shaved sweet potatoes. The elk was also surprisingly tender – it was cooked medium-rare, and had that great melt-in-your-mouth quality. The mushrooms and sweet potatoes added a pleasant richness (not to mention the crunch factor), and the croquettes (basically deep-fried mashed potato patties) were perfect – crispy outside, creamy inside. 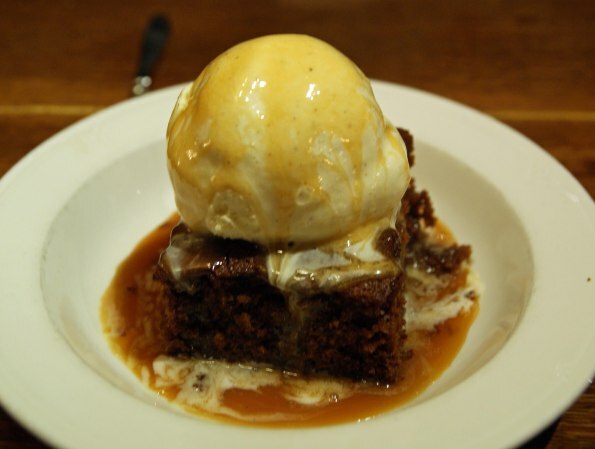 And for dessert, a housemade gingerbread with vanilla ice cream and caramel sauce. This one just jumped out at us as the perfect fit for a cold evening, which it was. Not too strong (sometimes gingerbread is a little overpowering for me), dense, and moist. The verdict: Gamekeeper’s gets six stars out of seven. Food was all excellent (only complaint was that the menu said our app[etizer, for you crazy techies] included gaufrettes, but our plate was devoid of them), service was excellent, and prices weren’t too bad, though a little on the high side for several entrees. The ambiance was very nice too – who doesn’t like to eat by a fireplace when it’s snowing outside?